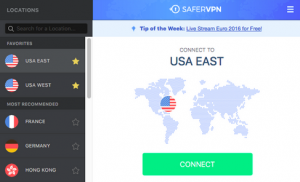 SaferVPN is based out of Israel, and as such, has come close ties with the United States. Many people have qualms about using domestic US services, but is SaferVPN actually safer than other alternatives, and do they have a favorable logging policy? We’re going to answer these questions (and more) to help you decide whether or not their trustworthy. As you can see, they tend to be in the mid to low price range. The majority of other providers are going to cost more, but they aren’t the cheapest option. To give you some perspective, note that on the high end, services like ExpressVPN cost $8.32 per month with an annual subscription. Conversely, on the low end, services like PIA VPN only cost $3.33 with an annual payment plan. One thing that I really respect about their service is the fact that they offer a free trial. Many competitors forgo a free trial in lieu of a money back guarantee, but SaferVPN has both. What’s even better is the fact that they don’t require payment card information in order to sign up for a free account. Some providers try to hook customers with a free trial, and then automatically bill them if they fail to cancel service within a specified time frame. But SaferVPN doesn’t play those types of games with their customers. They really are risk-free to try. But there is one downside. The free trial is unbelievably short. It only lasts 24 hours (I would have preferred it to last at least a week). I was moderately impressed with their global network of VPN servers as well. SaferVPN are continually working to expand their network and have servers in all the most popular geographic regions. Right now they have over 700 servers in 35 locations, which is decent. For the sake of comparison, note that new upstart VPN services typically have servers in 9-13 countries while some of the big dogs (like PureVPN) have servers in 140 countries. They don’t currently have a SmartDNS service, but as they claim on their website, it’s coming soon. One feature I found interesting is their “Automatic Diagnose Fix” feature, which they claim will help your application automatically detect and resolve any VPN connection issues. But as far as I can tell, this is just a simple renegotiation tool that helps a VPN tunnel attempt to reconnect. I was a little disappointed on their features page to find that they make the same bogus claims as most other VPN providers. For instance, they claim that they provide “the fastest VPN experience.” But every provider makes that claim. It’s like a diner claiming that they have the world’s best pie and coffee. A new feature recently added is their Automatic Wi-Fi Security. The VPN will start automatically as soon as the device connects to a public wi-fi hotspot. This automatic protection will give some protection from hackers that you won’t even have to think about or remember to switch on. SaferVPN also offer a Chrome extension which is convenient if you use that browser. Also, it seems that they have changed their service model in the recent past. Before, they had a packaging system, whereby higher level features were available for higher priced subscriptions. Now, however, it seems that the number of simultaneous connections you get depends on the type of plan you select. I couldn’t find the answer on their pricing page, so I live chatted with customer support (they answered me within 15 seconds). 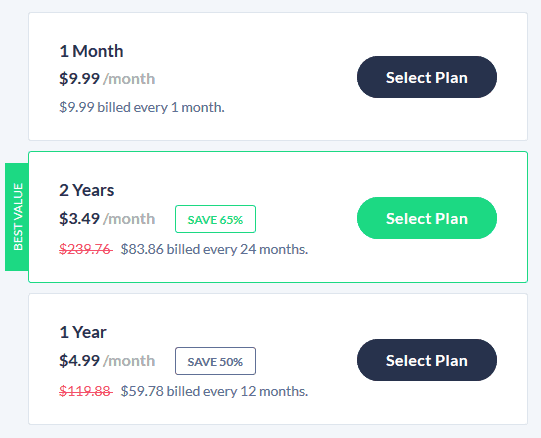 The Basic subscription allows you to connect 5 devices at a time, the Premium plan allows up to 7 simultaneous connections, and with the Business plan you can connect up to 10 devices at same time. According to the rep, if you need more devices, there are special B2B deals that can be discussed with their sales team. The recent update to increase the amount of simultaneous connections per account have placed SaferVPN ahead of the pack in the value per dollar department. Like most other providers, SaferVPN allows users to select among several VPN connection protocols to secure their data. They permit OpenVPN, PPTP, L2TP, IPsec, and IKEv2. However, I’d recommend staying away from PPTP unless you are simply unlocking inconsequential streaming content or trying to connect to a foreign game server. PPTP is inherently flawed, outdated, and easily cracked. However, it is still conditionally useful because it has less overhead, but only offers weak security. The date and time on which the session began and ended. The amount of data transmitted during the session. The VPN server location and from which country it’s been connected. Overall, I think SaferVPN does a great job of protecting their users’ anonymity and privacy, and they have high quality security algorithms to ensure that your data is truly safe online. I didn’t have any trouble streaming videos, and I didn’t even have any slow buffering problems. Even though the latency wasn’t the lowest I’ve ever experienced, it was steady and reliable. Altogether, I would give them an “A-” with regards to speed and stability. SaferVPN has a support page which is really an access point for their knowledgebase. I wish it were laid out a little better, but it’s still pretty easily navigated. The first thing you see on the page is a search bar, and you have to scroll down to see the different help article categories. If you want to open a ticket and contact support, you have two options. Either you can initiate contact through their contact page’s web form or by using the live chat feature. I’m quite partial to live chat features because they cut out all the annoying time spent on a phone listening to bad music. And live chat feels more instantaneous and direct than an email-based ticketing systems. But even though I’m biased towards live chat, I think the best customer service departments will offer all of these options. SaferVPN currently lacks and email-based ticketing option, and they also lack a telephone number. Still, the support page was more than adequate, and the guides included high quality images that make the configuration and troubleshooting process much easier. Also, I’d like to point out that when I pinged the support department on live chat, a customer service representative responded within 15 seconds. That made me very, very pleased with their service. In addition, he was not only knowledgeable about the different features of their service, but he seemed to have a deep understanding of how the technology works. I grilled him a little bit about which security protocols were secure and insecure, and seemed to really know his stuff. If I were grading them in a school setting, I’d have to give them an ‘A’ in the customer service department. Overall, I have to say that I was very pleased with SaferVPN. They are a low cost provider, their VPN tunnel has above average features, they have extremely strong security, they don’t keep any data logs, and the support was excellent. It is great to see that they are continually improving there service and have now added features such as anti-DNS leak protection and a VPN kill-switch. Also, I didn’t like how they laid out their knowledgebase articles. But these are minor nuances, and I can honestly say that I would recommend them to others. I did find it a little annoying that the free trial only lasts for 24 hours but it has the benefit, unlike others, of not requiring a credit card. It is a viable way for you to test out their service and see what you think. If worse comes to worse and you decide you don’t like them after singing up for a subscription, remember that they have a 14-day money back guarantee. In my humble opinion, this VPN service provider gets two thumbs up.